Feline Heartworm affects cats and for cats, there is no cure. Most people think of dogs when they hear the word heartworm. What many don’t consider problematic is feline heartworm disease. It does indeed affect cats as well and for cats, there is no cure. While on the subject of animals affected, we should know that heartworm also affects not only dogs but also foxes, coyotes, wolves, sea lions and more rarely humans. Why you may ask? Because it is one way a cat can get heartworms. A female heartworm living in its host dog, fox, etc., produce tiny offspring that the naked eye cannot see. These tiny worms circulate in the bloodstream of the host animal. Along comes the female mosquito, which needs a drink of blood to reproduce and make baby mosquitos. She bites the host and drinks up the infected blood. She picks up the microscopic baby heartworms in the blood. If that same mosquito then bites a cat she can allow the heartworm offspring to enter the lower layers of skin of the cat. From there the Larvae can work down into the muscles and eventually into the bloodstream, heart and other organs of the cat. Cats that live outdoors are twice as likely to get a heartworm infection. An important fact here is that Heartworms in cats have a shorter lifespan than other animals and it seems the cat’s body can rid the infection without treatment sometimes. If no spontaneous cure happens, then between 2 to 3 months an inflammatory response will happen in the arteries and lungs. It is now known that heartworms affect the arteries from the heart to the lungs more than the heart itself. Signs of infection are vomiting, diarrhea, difficulty breathing, coughing and gagging. Often the vomiting and diarrhea are thought to be other diseases that have those same symptoms. 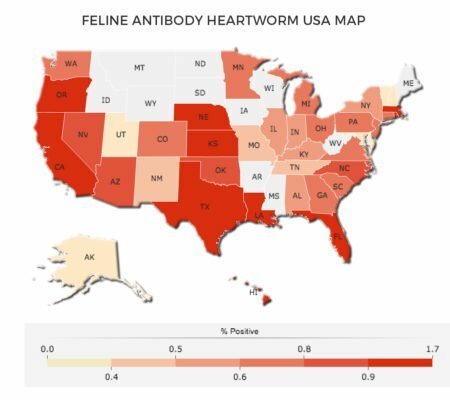 Therefore, testing for feline heartworm should include blood tests that look for antibodies, urine analysis, and x-rays to look for enlarged veins. To save your cat from this horrible malady they best possible path is monthly prevention. Drugs that work for prevention of heartworm infection are Ivermectin, milbemycin, and selamectin. Consult with your veterinarian for the best choice and application to suit your needs.